Your business probably has a Facebook Page and a Twitter account. And you have a LinkedIn company page where you’re growing a network of colleagues, employees, customers, partners, and business associates. And someone on your team is probably posting work-related photos on your company’s Instagram account. This is great! You have already planted your business flags on popular social media properties. Now, it’s time to grow your social media presence, drive engagement, and get real results that can impact your bottom line. You don’t want to tweet aimlessly or share Facebook posts on a “whenever” basis. That’s why you have to develop an execution strategy; otherwise, your content runs the risk of falling through the cracks. Identify your goals. Do you want to increase brand awareness, drive higher customer engagement, generate leads, or reduce marketing costs? Decide how you want to use social media in order to meet specific business needs. Set objectives, identify key metrics, and have a realistic timeframe. It’s important to plan ahead, but continue making additions when necessary. And keep your objectives and timeframes as realistic as possible. Trying to post 50 tweets a day or get 1 million new followers on Instagram in a month may not seem very achievable, so choose simpler objectives that are more realistic and practical given the social media resources that you have. Know your target audience. The more you know your audience, the higher your engagement and performance will be. As you get started, create buyer personas so that you’ll be able to reach the most valuable visitors, leads, and customers in your social media marketing campaigns. Check out what your competitors are doing. List down your closest competitors and check out which channels they’re using. Analyze their social media marketing strategies by looking at their fans and followers, their posting frequency rates, as well as the types of content they’re posting. You could argue that posting content is the part that’s most fun and exciting when it comes to marketing your business on social media. Content, after all, is what fuels social media. But don’t fall into the trap of posting for the sake of posting. Have a plan in place. Make sure that the content is aligned with your brand identity as well as the list of goals and objectives you have established. It also goes without saying that your social media marketing strategy needs engaging, high-quality content, be it in the form of text, links, images, videos, etc. Other forms of content include webinars, case studies, gated guides, and blog posts. Aim for content that’s highly relevant and not overly promotional. According to Sprout Social, 46 percent of users will unfollow a brand if there are too many messages being posted on social media that are promotional. Moreover, 41 percent say they will unfollow a brand if there is too much irrelevant content. An editorial or content calendar will help you stay organized. Building content themes will also help you section out the stuff you’ll be posting and the pace at which you’ll post them. Like it or not, online reviews shape and influence the purchase behavior of today’s consumers. Commonly posted on sites and apps like Yelp and TripAdvisor, as well as on social media platforms like Facebook, Foursquare, and even Google Maps, reviews carry potent word-of-mouth power that can draw or drive away potential customers. Research firm YouGov found that 88 percent of US consumers trust reviews as much as they do personal recommendations by friends and family. According to the 2018 Online Reviews Survey, 94 percent say that a negative online review has convinced them to avoid a business. 80 percent say the star ratings they trust the most are 4.0, 4.5, and 5 stars, and they don’t really trust businesses with ratings lower than that. The most successful social media marketing executives have learned to embrace reviews as part of their strategy. A report even found that as much as 83 percent of marketers believe that managing reviews “absolutely” delivers good ROI. 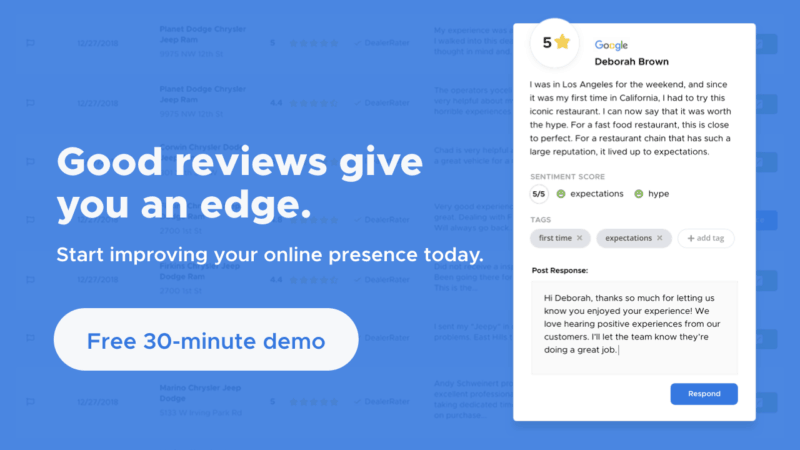 Online review management works alongside social media marketing to help you develop and protect your brand reputation, as well as gain insights about — and make improvements to — the customer experience. Identify the social media sites and online review sites most relevant to your business and claim your business listing or page in these sites. Engage your customers and face your feedback head on by responding to reviews. Encourage happy customers to be social and post positive reviews. Then share your best reviews on social media. Extend the scope of your social listening and customer support efforts to include online review sites, carefully identifying and resolving legitimate customer issues raised. You don’t need research figures to know that social media users spend a lot of time watching video content. So if your social media marketing strategy does not include video, you’re going to miss out on a lot of pretty valuable opportunities. Video content is a great top-of-the-funnel channel that allows you to more effectively drive awareness and engage users that may dismiss the information you’d otherwise convey through text. According to conversion specialists Crazy Egg, customers who have viewed a video of a product can be up to 85 percent more likely to convert. Keep it simple and short. In the social media age of short attention spans, it’s best to keep the running time of your videos to 30 seconds or less. It’s not always going to be easy to communicate everything you’d like and distill your message in half a minute, but studies suggest that shorter videos make your content more “shareable” and “likable” on social media. “Brand” your videos. Adding your logo or brand name can help reinforce familiarity with the audience. More importantly, it can increase affinity conversion, especially for viewers in the youth demographic. User-generated content or UGC refers to original content created and made publicly available by individuals outside your organization or brand: your customers, your fans, your online reviewers, your brand advocates, and even your online critics and detractors. Consumers today are more proactive and research-driven, eager to validate their purchase decisions by searching for peer-contributed information on social media. Which is why UGC can help supercharge your social media marketing strategy. According to marketing research, UGC and peer endorsements hold more sway than celebrity influencers, and are 10 times more likely to drive in-store purchases. Platforms like Facebook, Twitter, and Instagram operate mostly or entirely on user-generated content. This makes UGC campaigns so much more effective than campaigns run on traditional media. They’re also perfect for integrated, multi-channel initiatives, and can even be used to amplify your own branded campaigns. Read our blog post on amazing user-generated content examples of campaigns from the world’s top brands. A core element of social media is its ability to connect people, drive conversations, and share content across networks. Do your part by joining the conversation and listening in to what your community members are talking about. Don’t hesitate to “like” or comment on your followers’ own posts, and respond to tweets, mentions, or comments left by others on your pages. Be present, be available, and talk to your audience. Social media has also transformed how businesses handle complaints and respond to customers’ needs and expectations. On Facebook, Twitter, Instagram, and other channels, have a process in place for identifying and resolving customer issues. Trust us: with social listening, you’ll be able to gain access to a wealth of information that you can incorporate into important business decisions. The most successful social media marketing strategies don’t fail to analyze efforts, report on key metrics and data, and use insights to drive improvement. If you have the resources, use a tool to track your success. Always measure your results, track your performance, and let the data drive you. This may seem like common sense, but according to reports, 46 percent of B2B marketers are not even sure if their social media marketing strategy actually created revenue for their brand. If the data is telling you that LinkedIn isn’t really delivering the ROI you’re looking for, consider other channels. Or if it’s telling you that Instagram is your most effective channel, double down. The key is to tweak and refine and make changes whenever necessary.